Many think that Book or Ra is the most popular Novomatic slot. It’s true, unless you consider various reproductions of the same slot, and here we get to The Money Game slot. The Money Game, with its 15×3 Free spins is actually another version of the Dolphins Pearl, which is by itself a reproduction of the popular Lucky Lady’s Charm slots. These games all share similar features and paytables, the only difference is the theme they use. So if you sum things up, these are in fact the most played Novomatic slots, which is not a big surprise since their roots lie in one of the most popular slot of all times, Cleopatra slot. IGT Cleopatra slot was quite revolutionary at time. It was the first slot to introduce the 15×3 feature: 15 free spins with x3 multiplier. 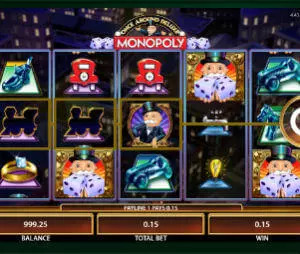 Now, it might look strange since almost every slot has free spins and multipliers of some kind, but don’t forget that this slot was launched years ago. The Money Game and its sister slots use the same features that brought Cleopatra its popularity. The main one is the free spins. These are triggered by 3 scatters and get 15 spins which can be re-triggered multiple times. As we said before, all wins from the free spins are tripled. Another feature that those slots share is the Wild multiplier. The Wild, which is represented in The Money Game by the Business man symbol, can substitute for all other symbols except the scatter. When it does, your winnings from this combination are doubled. 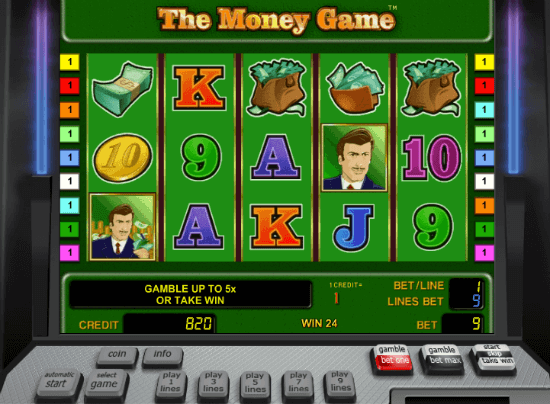 The Money Game slots features 5 reels and 9 paylines. You can choose how many lines to play, 1 to 9; how many coins to bet per line, from 1 to 100; and the denomination – how much each credit costs. You should know that these slots are considered medium/high volatility therefore we recommend to start with lower bet per spin. If you are patient enough, then you can even make few spins for free at MyBet casino and get the feeling of how the slot pays. It’s one of the big advantages of online slots and there is no reason not to use it.